Nanny bought me this cool plant and pot at IKEA while she was in town. I just love the way it looks on the half wall between the dining room and the living room. I hope I can keep it alive! I have a bit of a black thumb! 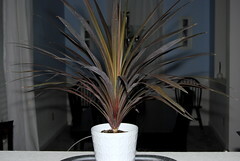 *Ok, so just learned while finding the links for this plant that it is ideally an outdoor plant. Sigh. I’m the Grim Reaper of Plants. It is a curse.